Indirasite: Indigenous Film Festival in New York: a new history! Indigenous Film Festival in New York: a new history! 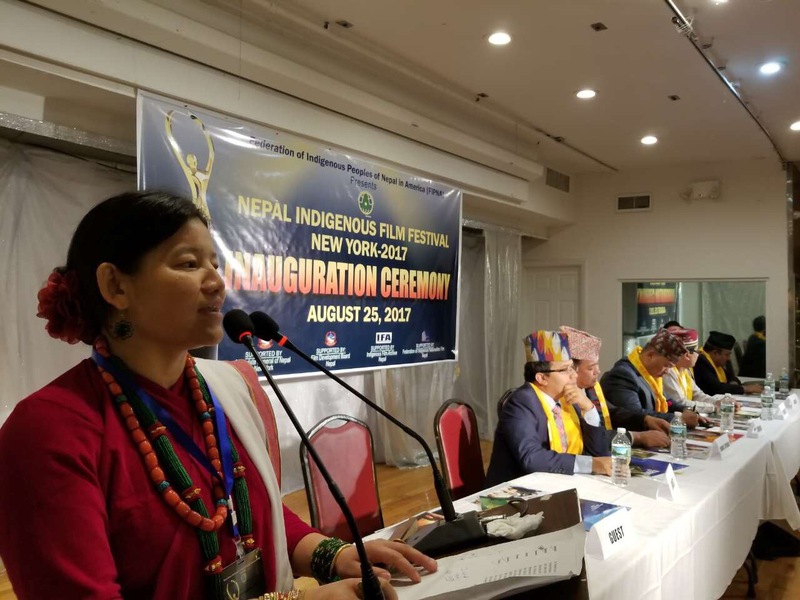 On the commemoration of 23rd world indigenous day, Federation of Indigenous People of Nepal in America (FIPNA) celebrated the Nepal Indigenous Film Festival 2017 in New York for the first time making a new history. The motto of organizing this event was to promote and inspire the Indigenous filmmakers of Nepal, which are highly marginalized by mainstream films. festival. The Lomba, film by Magar wins the best award along with the best director and best costume. It won the prize of Rs.100,000. Lomba from Magar, Sherdahak from Mustang, Krishna Gautamki from Newar, Helukwa from Limbu and Sema Tabai from Tamang were nominated for the best award. As per the media coordinator of the festival Machchhe Gurung, the motive of this festival was also connected with the preservation of the indigenous languages, culture, tradition which have been dominated in the country and in the process of disappearance because indigenous languages are not used as a speaking language for day-to-day activities in offices and schools. In addition, due to the modernization and globalization, the indigenous costumes and cultures are in danger, as everyone prefers to wear the modern clothes, which are imported through, out the world. During that Festival, the actor of Sherdhak Chhewang Ranjit Gurng wins the best actor title, the actress of Mairomi (Gurung film) Sapana Gurung wins the best actress title, Prabina Puma wins the best script writer for Sumnima( Rai film), Rajkumar Moktan the best music director and adumbration from Sem Tabawi and the best title in editing Balkrishna Banshi from Krishna Gautami. Moreover, the participatory films have won the different 11 categories and received the trophy on their respective titles. This program was held in cooperation with the Federation of Indigenous film and the Indigenous Film Archive and it was supported by the Consulate General of Nepal in New York and New York and Nepal film development board.